Each one of these videos is a progression to the full power clean. 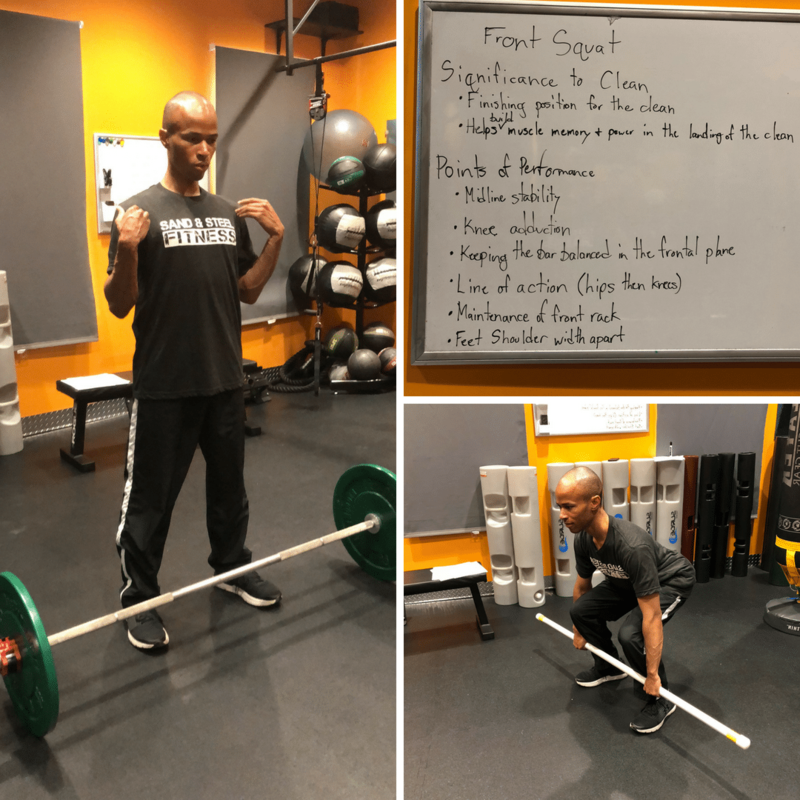 When you or a client demonstrate one or more faults during a power clean, there are specific technical skills that will target each fault and when practiced, will allow you or that person to perform the clean more effectively and injury free. You should always start with the initial position to see if the person is starting the movement correctly. 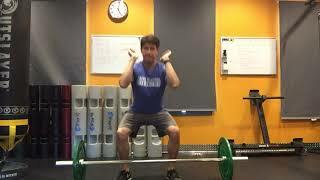 What the feet stance looks like, hands placement on the bar, are the shoulders behind or in front of the bar? These signs will give you an insight into what faults the person will make later on as he or she continues with the full clean movement. It is much more efficient to take care of any technical errors as they appear. 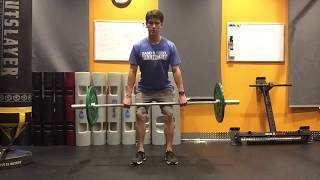 The following videos will assist by breaking down the power clean and correctly practicing each skill until they can be combined into one smooth motion. The hanging position will be your starting position for most subsequent movements up to the full hang clean. 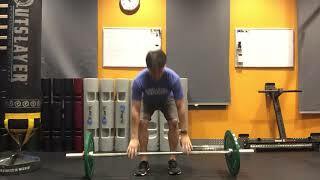 This position will be emphasize proper balance with the bar at arm’s length. The barbell is going to be positioned at mid-thigh (above the knees) with your center of gravity in front of the heels. The hinge coming from your hips and the torso leaning forward will help to maintain proper body alignment of balance. Remember to keep chest high and back flat. A flat back does not mean completely vertical; you can still maintain a neutral spine while holding the hinge position. The final look will place the shoulders slightly in front of the bar. The mid hang clean jump skill movement is what will eventually become the second pull of the clean [citation]. 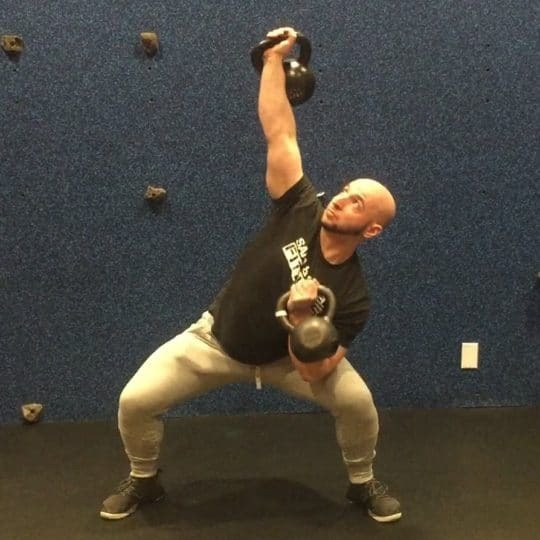 The second pull will take advantage of the power coming from the extension of the hips and knees to start accelerating the bar up in the air. 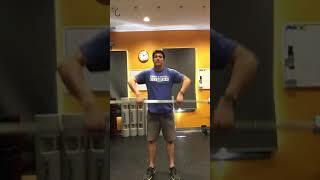 This movement is great to get accustomed to the body jumping while holding any amount of weight you are using. Start with the bar slightly above the knees, weight of the body in front of the heels, lats engaged and chest up. Jump straight up with arms relaxed and elbows straight. Land on the same spot as the position that the jump started from. 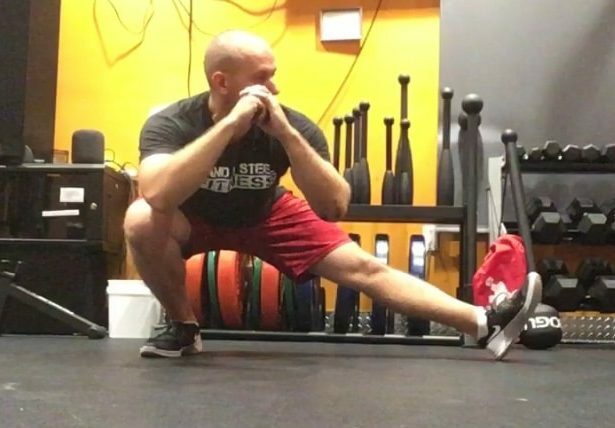 Let your feet come completely off the ground during the jump to get accustomed to this powerful movement before integrating it to a full power clean. 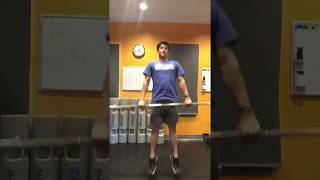 We can now perform the same movement but adding hips and knee extension to develop more power. The arms and hands will be kept with in a narrow grip on the bar and hands relaxed as much as possible. 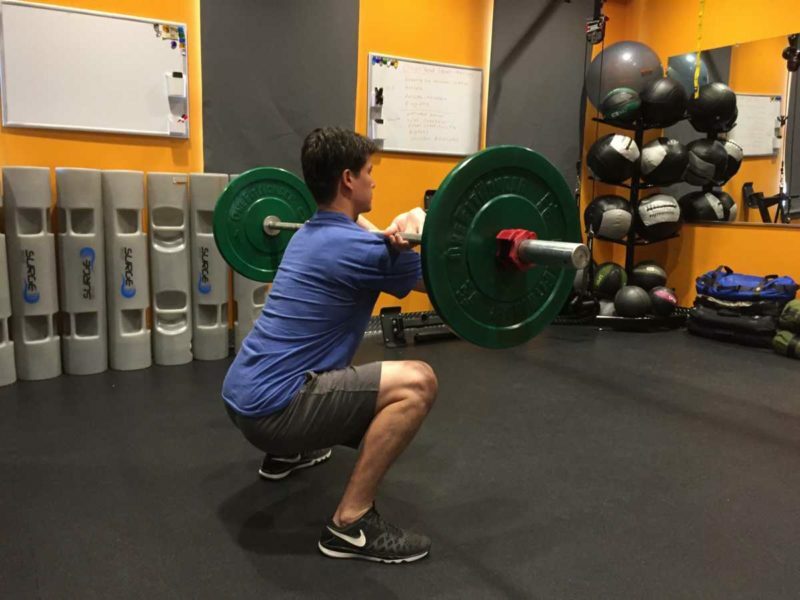 A lot of people will want to bend the elbows at the same time the hips are extended, doing so will lead to pulling the bar with the weights and loosing all power coming from the knees, hips, and glutes [citation]. Continue with the starting hanging position that was demonstrated in the first video. This time you will create power by squeezing straightening your knees, squeezing the glutes to extend the hips, and transition this power/momentum onto the shoulders elevated and finally to the rack position. Emphasizing the rack delivery as a separate movement is critical when handling a greater amount of weight. The goal is to make the transition from high pull to rack position as smooth as possible. Once the elbows are elevated to the maximum, relax the hook grip and allow the elbows to come around the bar the wrist to rotate on the bar. 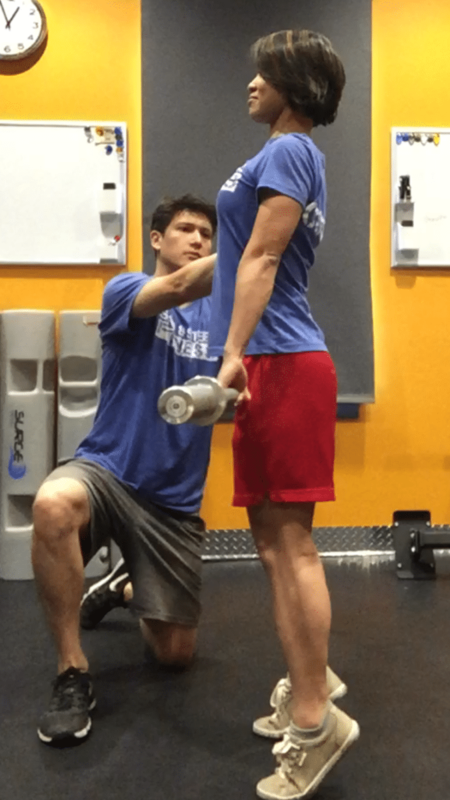 The timing of the wrist/hook grip relaxation with elbow rotating will allow the weight to land properly on the shoulders when performing a full power clean with any weight. 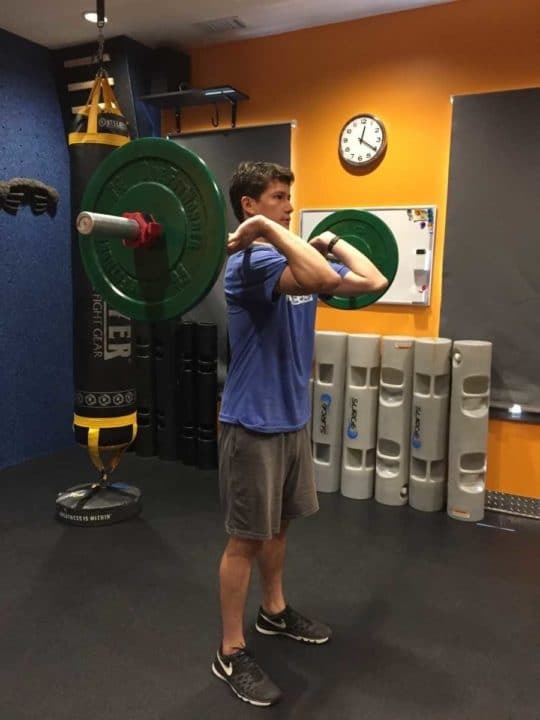 If you have trouble bringing the elbows at least to shoulder height or bringing the elbows to the height of the bar once it rotates around it, it may be best to do some mobility exercises for them before moving on to greater weight or doing too many repetitions. After the elbows have spun around, bringing the shoulders slightly forward will create a cushioned bed for the bar to land on. The bar should never land on any bony marks on the shoulders or chest. 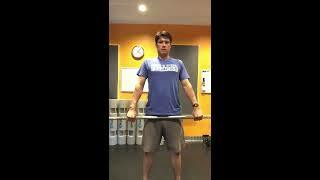 Remember always to maintain tension at the trunk and glutes when receiving the bar. When the body is compacted that way, it creates a solid platform for the bar to be secured more effectively. You must keep the bar close to the body during the whole movement. 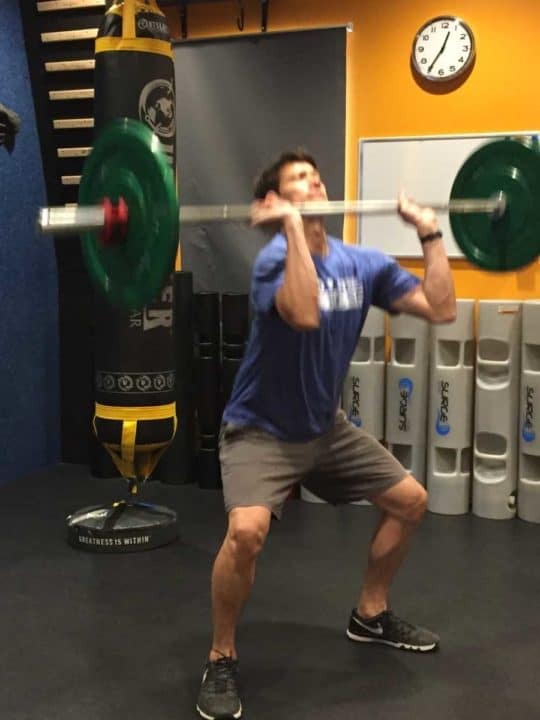 If the weights comes out too far in front, the distance between the bar and the rack position increases, intensifying the force of the weight onto the shoulders and causing the shoulders to round excessively. The tall muscle clean movement will not use any part of the lower body. 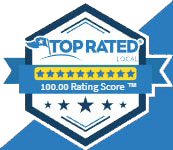 It is specifically practiced to feel the comfort of the weight and bar from the hanging position onto the shoulder delivery in a smooth fashion. 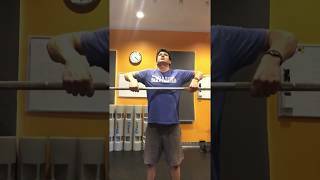 The path of the bar towards the throat and elbows elevated will get you ready for the third pull and will and eventually to the rack delivery. 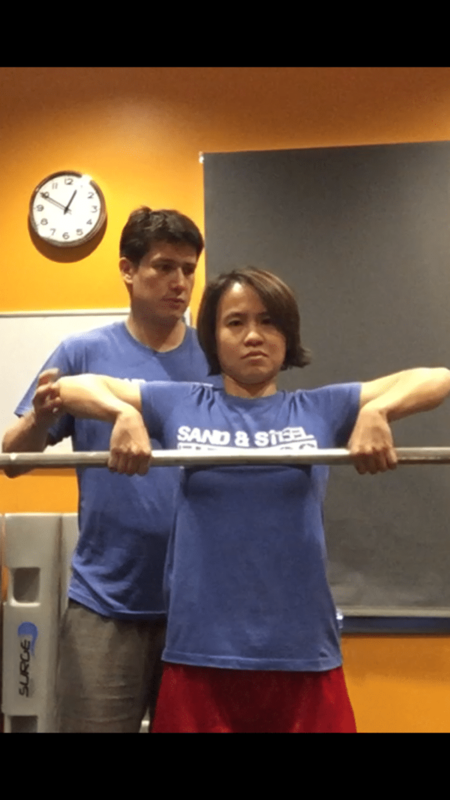 As the bar’s path continues to travel upwards, maintain the shoulders shrugged and the shoulder blades contracted. At this point, the elbows will once again travel down and around the bar to secure it effectively onto the shoulders. 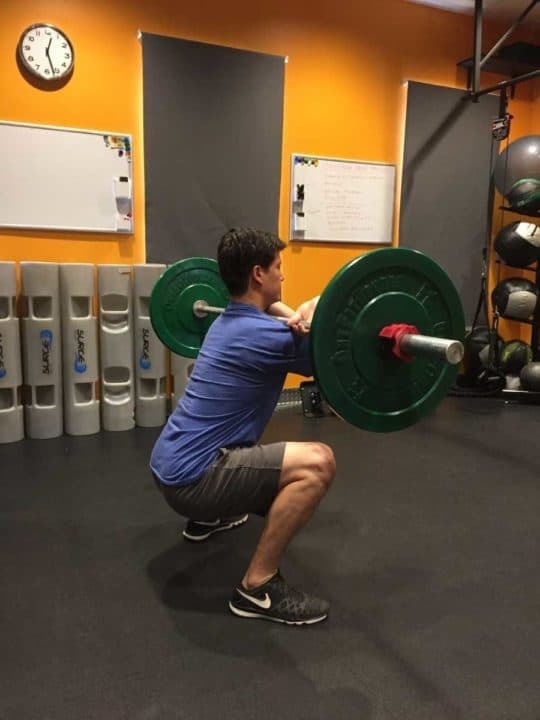 Again, do not involve the lower body during this exercise, it is purely a muscle clean which means it will be performed in a standing position. 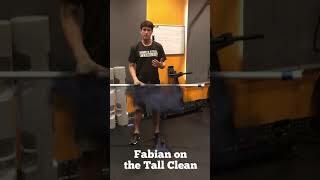 The tall clean teaches you how to get comfortable with the third pull of the power clean. 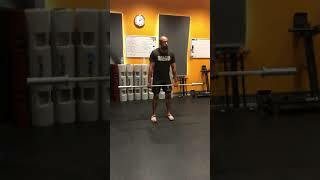 Standing from an upright position, simultaneously bring the elbows as high as possible and lift the feet (jumping) so you can land firmly on the ground in a partial squat or full squat position, ready to receive the bar in the rack delivery. 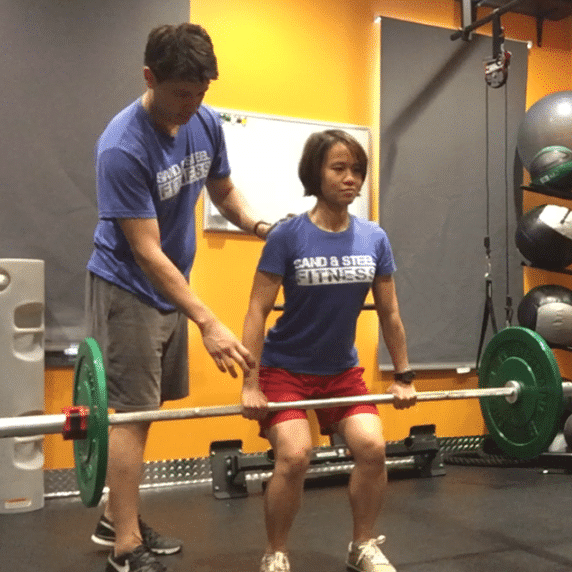 When the elbows have reached their highest point allowed by the body’s mobility, pull against the bar to accelerate the body under, turn elbows down and around the bar, and receive it in rack position. This is timed with feet landing on the ground. 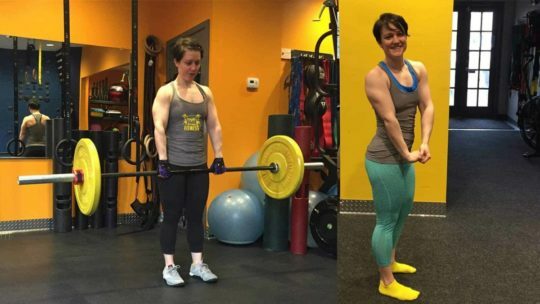 Remember that you are literally pulling your body under the bar and NOT simply letting your body drop under the bar, nor attempt to “catch” the bar on your shoulder with a stiff body. This will lead to serious injury to the shoulders, writs, collar bone, etc. The shoulders in rack position and the bar should meet in a partial or full squat to soften the weight and decelerate it coming downwards. Now let us combine what we have learned and demonstrate a hanging clean.